Flotronics range of EHEDG Certified Diaphragm Pump s have been designed for the food, beverage, dairy and pharmaceutical industries and tested to exacting performance standards by EHEDG, Flotronic’s ‘E’ series pump features polished wetted surfaces to 0.8μm Ra or better and an electro-polished overall finish, making this pump the ideal choice for any environment or process where avoidance of product contamination is paramount. Flotronic’s ‘H’ Series 3-A Pump has also been designed for conditions demanding rigorous hygiene standards. The ‘H’ Series has been accredited by 3-A Sanitary Standards Inc, the US-based independent not-for-profit corporation dedicated to advancing hygienic equipment design for the food, beverage and pharmaceutical industries. 3-A SSI accreditation confirms that ‘H’ series parts and raw materials are of the highest quality with their provenance duly certified. Flotronic Pumps ‘H’ Series pump range has been designed to meet the exacting hygiene standards of 3-A Sanitary Standards, Inc (3-A SSI) and to be used in processes where hygiene is paramount. The ‘H’ Series, therefore, offers tremendous benefits for the food, beverage and pharmaceutical industries and any other environment where sanitary integrity is necessary. EHEDG Certified Diaphragm Pump accredited versions are also available. The ‘H’ Series pump has been designed to meet the high ‘cleanability’ standards demanded by 3-A SSI. These include ease of cleaning for all product-contact and non-product contact parts. 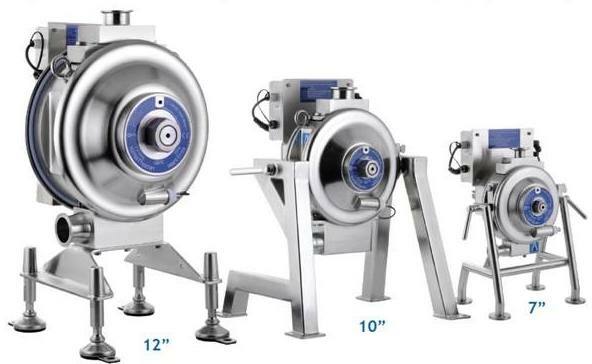 All ‘H’ Series pumps can be thoroughly Cleaned in Place (CIP). The 7” and 10” ‘H’ Series pumps have a support stand allowing rotation of the pump for easy and effective media draining. Gravity separates the ball valves from their seats in this inverted position and cleaning and other fluids easily drain away from the inverted delivery nozzle. The 12” ‘H’ Series pump has been engineered to drain any CIP solutions while being fully upright – allowing hard piping if required. This larger pump has check ball valve seats engineered to allow drainage without inversion. All three pumps can be cleaned by flushing with a suitable CIP fluid dependent upon the application and compatibility with the pump wetted component materials. They also have internal radii surface finishes and plastic parts provenance that meet 3-A SSI standards. The innovative, easy-maintenance, ‘ONE-NUT’ design for which Flotronic is renowned is integral to each ‘H’ Series pump – allowing pump maintenance in a matter of minutes. Unique to Flotronic, the ‘H’ Series pump can be fitted with diaphragms which are reinforced. Reinforcing plates add support to the diaphragms and ensure that the pumps can withstand CIP/SIP pressures of up to 6 bar in the suction line. This means the pumps can be Cleaned in Place using fully automated CIP units incorporating external CIP pumps, without the need to bypass the pump. ← Flowserve Valtek GS – Short Lead time Control Valve.. !